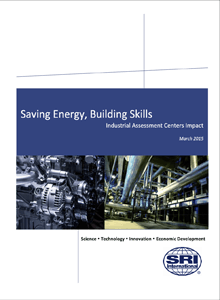 SRI’s assessment of the IAC program impact on energy savings by manufacturers and IAC student alumni skills evaluating evidence of degree of impact. In order to organize the data in a useful way, a coding system called the Assessment Recommendation Code (ARC) has been developed to list each recommendation. As part of the Climatewise program, Professor Muller and other technical staff of the OIPEA have been involved with adding an energy and waste component to the PICOS supplier development program run by General Motors. As part of these activities, the GM people observed an IAC style assessment in New Jersey. Professor Muller then spent a week in Charlotte observing a PICOS assessment. During this information exchange it became clear that IAC assessments could be more effective if additional efforts were put into direct productivity issues. Recognizing that we have had training courses for center directors on energy and waste, it was concluded that an additional course should be assembled on productivity. The PICOS program is a long running industrial assessment service provided by GM for their suppliers based carefully on the Toyota Production System. The goal of the program is to improve the productivity of suppliers and pass the savings on to GM, which has a policy of continually paying less for a product each year. They are proud that they never tolerate price increases. The workshops, as they are called, use a team of normally two Supplier Development Engineers who are in the plant for 3.5 days. These are people with a variety of backgrounds and for the most part are not engineers. They make some suggestions themselves, but rely mostly on working groups of plant personnel to come up with cost saving ideas. Implementation of good ideas is expected to be immediate. Layout changes, for example, are often accomplished while the PICOS team is still there. Until recently, staff in the PICOS program did not concern themselves with waste or energy, but focused entirely on productivity issues. We can learn a great deal from the general approaches they use, but proprietary concerns will prohibit us from adopting any of their practices directly. We hope to provide some background material, but concentrate on a number of worked examples of various kinds of productivity recommendations. The goal of the training is to provide directors with several tools which they can apply directly. Additionally, by showing the large impact of some of these recommendations, it is hoped that director's themselves will be motivated to develop their own novel tools and fixes. 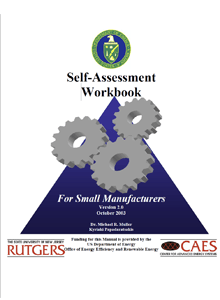 The intention of this workbook is to provide the small manufacturer with a self-assessment method of improving operations and reducing costs. In order to organize the data in a useful way, a coding system called the Assessment Recommendation Code (ARC) has been developed to list each recommendation. This coding system will change with new technologies. The database resulting from assessments carried out by Universities for the Department of Energy's Industrial Assessment Center (IAC) program contain a list of recommendations involving enhancements in energy efficiency, waste minimization and manufacturing productivity. In order to organize the data in a useful way, a coding system called the Assessment Recommendation Code (ARC) has been developed to list each recommendation. 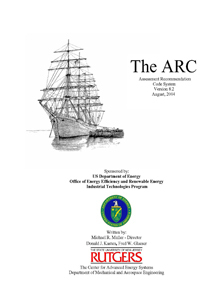 The list is assembled and is maintained by the Center for Advanced Energy Systems (CAES) at Rutgers, the State University of New Jersey. The majority of the recommendations for increased energy efficiency come, in some part, from the list presented in the early Department of Commerce Guidebook (EPIC)1. The recommendations for waste reduction used, in part, a list assembled by Professor Richard J. Jendrucko, Thomas N. Coleman and Todd M. Thomas of the University of Tennessee and their contribution is gratefully acknowledged. Most recommendations can be collected into groups that focus either on the same system or on the same general strategy for enhancement. Attempts were made to develop a coding scheme which would be consistent along either one of these lines, but neither approach proved satisfactory. The resulting organization of recommendations has been done in an "expert system" fashion. Therefore, the code has been assembled to best collect recommendations which would be considered together by an experienced professional. For example, recommendations for energy savings for air compressors (a system) are grouped. In a similar fashion, recommendations for waste heat recovery (a strategy) are collected together. A coding system like this will change frequently as new technologies and strategies reach the manufacturing floor. Therefore it is important that the database version being used match the ARC code version. The first number, "X" is the recommendation type. Examples are 2 for energy savings, 3 for waste reduction, etc. The second four numbers, "YYYY", detail the strategy being employed. The final number, "Z" is the application of the strategy, indicating whether the recommendation impacts the process, the building and grounds, or other application. 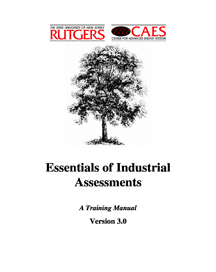 This manual provides technical training to a range of potential end users interested in performing industrial assessments at small to medium sized manufacturing plants.